Red Socks Go With Absolutely Anything was such an inspiring story for myself and children. The same day I received the book, I sat with my children and read it to them. It was the perfect bedtime story. My youngest (nearly one year old now) seemed to enjoy the black, white, and a splash of red color scheme, while both my eight and two year old boys really enjoyed the story itself. I adored the message the author set forth in her book and it made me want to wear red socks! In fact, I ended up buying the whole family red socks so we can wear them when I read Red Socks Go With Absolutely Anything. 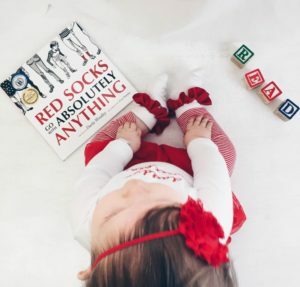 It’s a book I now plan to read weekly to them and I hope Red Socks Go With Absolutely Anything is a book they will remember into adulthood and carry on a tradition of their own to keep the inspiration alive in their family. Samantha … so glad to hear that you enjoyed the story. Thank you for your kind words. You made my day! Flash those red socks proudly!